2016 comes to an end – welcome 2017! By Mauricio Sulaiman – 2016 comes to an end – welcome 2017! As we all try to slow down to enjoy a few quiet moments in the company of our loved ones, thinking about what happened this year and planning on what we wish to do for 2017, it is a great opportunity to simply meditate and reflect on our own actions and what can we personally do to make the difference in our lives and the lives of others. It is so common that we get lost in the day-to-day pressures, deadlines, worries, excessive work, travel, and eternal use of the cell phone. We often forget to look at today, to realize what we have, who is next to us, how fortunate we are to have health, to be alive, to have our loved ones close. We forget to appreciate and cherish what is there. Available with hindsight, our reflections can only give us memories, those that build over the weeks, months and years, and we look back and understand that we let those precious times go by without knowing it. GGG vs. Brook sells out O2 Arena in London, while Chocolatito vs. Cuadras sells out the Forum in Los Angeles simultaneously! Canelo Alvarez draws 50 000+ plus fans at the AT&T Dallas Cowboys Stadium! Several fights compete head-to-head for “Fight of the Year” honors! The heavyweight division is back in the world’s interest! Female boxing finally makes an impact in USA! Pope Francis creates BoxVal, a world program under his Scholas Ocurrentes Foundation! Amateur boxing finds an alternative after the disaster and failure of AIBA and the Olympic games competition! Boxing in the U.K. flourishes like it was decades ago! The world of boxing unites during the sensational WBC annual convention with a memorable homage to Muhammad Ali in the presence of so many heroes from the past, today, and tomorrow! Japan closes the year with 8 championship fights for New Year’s celebration! 2017 starts with a BANG! On January 14, WBC super middleweight champion Badou Jack will unify with IBF champion James DeGale. January 28 will feature sensational cards in Las Vegas as Richard Schaefer returns to action with an incredible doubleheader with Mikey Garcia trying to conquer the WBC lightweight title against champion Dejan Zlaticanin, and Leo Santa Cruz tries to avenge his only loss in the highly-anticipated rematch against Carl Frampton in a fight where the WBC Diamond belt will be awarded to the winner. Also on January 28, Golden Boy Promotions will also feature a tremendous card in Los Angeles, as WBC super featherweight champion Francisco Vargas, who has won the honors of “Fight of the Year” in 2015 and 2016, battles Mexican rival Miguel Berchelt, and former champion Takashi Miura fights Mickey Roman, with the winners of both bouts to meet during the summer. January 28 will also have the pound-for-pound queen of women’s boxing, Cecilia Braekus, defending her WBC mandatory vs. Klara Svenson in a co-promotion of K2 and Saerland Event in Norway. February will see the return of WBC heavyweight champion Deontay Wilder. Cancun Boxing will present the first-ever card in paradisiacal Cancun opening the first fullly established casino. March will feature the dream match, a unification bout between WBC welterweight champion Danny Garcia and WBA champion Keith Thurman, two undefeated champions looking for supremacy. March 18 will see a soldout Madison Square Garden as Gennedy “Triple G” Golovkin defends againste Daniel Jacobs, and Chocolatito Gonzalez most likely will fight the highly anticipated rematch vs. Carlos Cuadras. Anthony Joshua and Wladimir Klitschko have already sold over 60 000 tickets!!!! And so many other fights are being processed. 2017 will prove to be a great year for boxing, and will show all those “grinches” that our sport is unique and will continue to grow all over the world. Continue the Clean Boxing Program around the world. Continue to develop women’s boxing, and have them conquer the American market. Continue the WBC Amateur program to be a platform to all those regions and programs which have been abandoned by AIBA and the national federations of the world. Continue the medical research program with UCLA and implement pilot programs to make boxing safer for the fighters. Continue to mediate with all parties to try to make the best fights possible, and give the fans what they deserve. Continue BoxVal and implement programs worldwide, like the highly successful 2N1D – 2 Nations 1 Dream – Boxing without Borders implemented in 2016 in Chicago, Acapulco and Mexico City. WBC licensing and merchandising program will make a statement! As 2016 settles into the history books and we all gear up for 2017, I want to express my deepest gratitude to my beloved wife, Christiane, as she has been my partner and taken care of the so many difficult tasks that a family must face; to my mother, for her unconditional support with her sweet smile and always wise and comforting advise; to my brother Hector, who has taken the lead of running our family business and factory with my sisters, Lucy and Claudia; to my brother Fernando, who has been there to support many of the programs that we have launched in this process; and to my “boss” Pepe, who runs the WBC Los Angeles office, getting to experience the lives of the boxers and making so many friends in the world of boxing. This is my beautiful family, all together in harmony to celebrate Christmas . To my heroes, the WBC Champions of the world! Deontay Wilder, Tony Bellew, Adonis Stevenson, Badou Jack, Gennady Golovkin, Jermell Charlo, Danny Garcia, Terence Crawford, Jorge Linares, Dejan Zlaticanin, Francisco Vargas, Gary Russell Jr., Oscar Escandon, Shinsuke Yamanaka, Roman “Chocolatito” Gonzalez, Ganigan Lopez, and Menayothin! 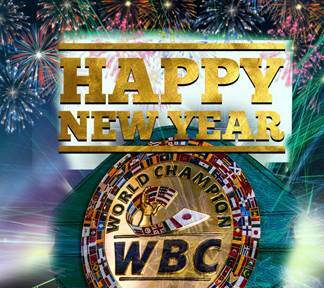 May God bless you all and may 2017 be a formidable year, long live Boxing, Long Live the WBC! Thank you and I welcome any comments, ideas, or suggestions at contact@wbcboxing.com. You are here: Home / Boxing News / 2016 comes to an end – welcome 2017!